I have been running a ten inch #1 grind blade on my Unisaw for the past year and have made thousands of cuts in making boxes. It is finally dull, but has outlasted the Freud blades by three or four times. The Chopmaster on my Mekita saw is ideal for veneer and I can even cut single sheets with no splinters. I am completely sold on your blades. They are worth every penny. Keep up the good work. Use MicroJig MJ Splitter Kits for added table saw safety. 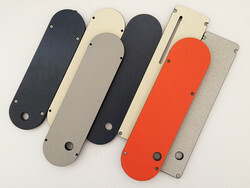 Available in THICK or THIN kerf they are easily installed and simple to align. Not for use with Leecraft inserts that already have the riving knife slot cut in. Intended for inserts WITHOUT the riving knife slot. Place insert in table with finger hole at front, label side down and starter pocket located over blade. Run leveling screws down until insert is stable and flush with tabletop. Back out end-adjustment screw and side adjustment screw to achieve a fit that is snug, yet removable. Use finger hole provided for easy removal. 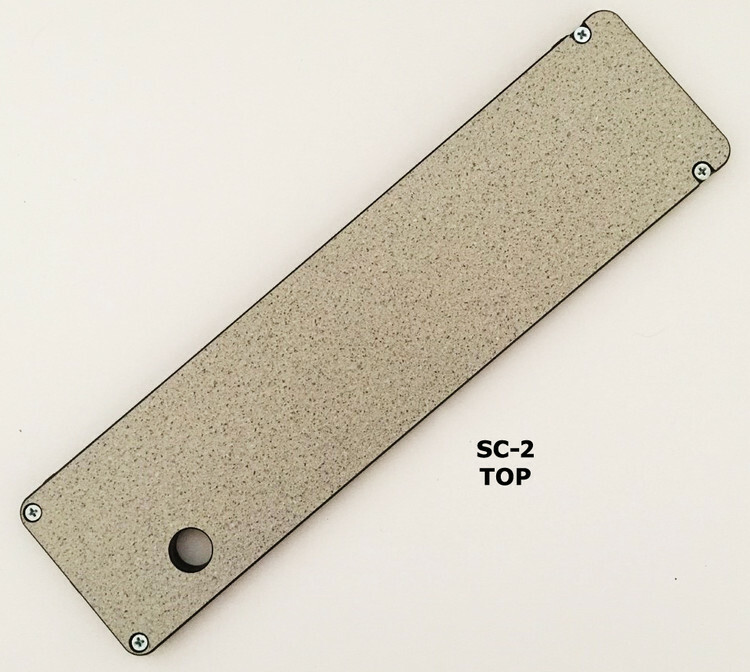 If the insert will not go down flush with table top because it is resting on top of blade, then raise up using leveling screws until insert is sitting steady slightly above tabletop. This should provide adequate clearance for blade. Check that insert is fitted properly, and that blade is clear. Using a stick, reach under the table and rotate the blade manually to check for blade clearance. Fully cover the insert with a board, and clamp at each end to the table saw top. Re-connect power to saw. Switch on, slowly and cautiously raise blade up, to cut its way through the insert. KEEP HANDS OFF OF TABLE TOP, STAY CLEAR AND WEAR GOGGLES. Raise blade to maximum height at this time. Lower blade, turn off saw, and remove board. Your insert is now ready for use! Only recommended for use with carbide tipped cutters. DADO BLADE - Use same procedures outlined above, but use additional caution due to excessive material being machined from insert during the slotting procedure. Under certain conditions, an undesirable scraping noise may be generated by your saw blade. Planer type blades and/or excessive arbor run-out, and/or blade distortion, may be causing intermittent contact with the insert slot. To remedy this, remove the insert and slightly widen the slot using a file or sanding paddle. Ideally, a separate insert should be used with each blade, dado stack, or angle set-up. This will insure a true "zero-clearance" effect and give you maximum benefit from your inserts. Need help picking the correct Forrest Saw Blade or accessory?